Today I want to write about an Australian bug with a really cool name, the cowboy beetle. These large beetles grow up to 2.5 cm long and females are slightly larger than males. The adult cowboy beetle feeds on nectar and plant matter, whilst the larvae eat rotten wood. The eggs are laid in rotting logs, so that the larvae can start eating as soon as they hatch. Their special colouring and the loud buzzing noise that they make when flying makes them look like wasps, helping to keep predators away. 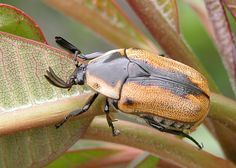 Cowboy beetles are found in south-eastern Australia in the forests of Victoria, New South Wales and southern Queensland. Are there any other interesting facts that you would like to share about cowboy beetles?